I seen one of the hotels i stayed in on the telly the other day. It was getting washed away. Shocking the amount of people that have been killed. There is no real structure in Sri Lanka, I mean a lot of houses over there are like shacks and still live without electricity and running water. When I was there a lot of the people just seemed to stand at the roadside in the sunshine watching the world go by. Lovely people. 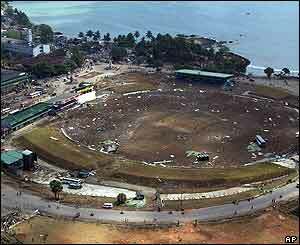 This is the cricket ground in Galle….